This past Sunday I made the most amazing bialys! It was a fast day and I like to busy myself with food preparation on a fast so that I get distracted from my hunger, and I have something special to serve my family and friends who traditionally join us for the “break fast”. The bialy originated in the city of Bialystok in Poland. 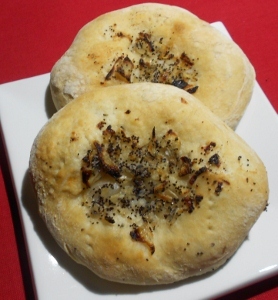 It is a doughy roll with a flat center and puffy rim, sprinkled in the center with sauteed onion & poppy seeds. Most bagel stores make bialys from their bagel dough, and bake it without boiling it, making it a cousin of the bagel. My homemade version was made with a yeast sponge that sat for over an hour before adding the flour, giving it a bit of a sourdough flavor. Although I’ve never tasted an “authentic” bialy, I can honestly say that mine was delicious; crusty on the outside and soft on the inside, as artisan bread should be. Bialys are mostly eaten split open, toasted, and slathered with butter, but we ate them fresh out of the oven with a cream of broccoli soup (compliments of Sarah Lasry, thepatchkeprincess.com), scrambled eggs, hash browns and salad. They were awesome! Today, I had a leftover one for lunch and can’t decide which way I like ’em better! 1. Pour 1/4 cup of the water into a small bowl, add the yeast and a drop of the sugar and whisk to combine. 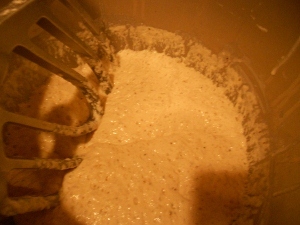 Allow the mixture to rest until the yeast dissolves and turns creamy, about 5 minutes. 2. Meanwhile, melt the shortening in a small skillet over medium heat. Add the onions and saute until softened, about 3 minutes. Scrape the onions and the melted shortening into a bowl of a mixer fitted with the paddle attachment. Add the remaining 2 cups water, sugar, and the black pepper, if using. 3. Add the creamy yeast to the mixing bowl, making certain that the temperature of the ingredients already in the bowl doesn’t exceed 110 degreees F; if the mixture’s too hot, give it a few minutes to cool before proceeding. With the mixer on low speed, add the flour in a steady stream, mixing until the flour is incorporated. Increase the speed to medium and beat for 3 minutes. Scrape down the bowl and paddle with a rubber spatula and remove the bowl from the mixer. 4. Cover with plastic wrap and let the sponge rise at room temperature for 1 and 1/4 hours. 1. Heat the vegetable oil in a large skillet over medium heat and saute the onions and poppy seeds until the onions are soft, 3 to 5 minutes. Season with pepper and let cool. 2. Brush the inside of a large mixing bowl with some of the oil; set aside. Reserve the remaining oil for coating the top of the dough. 1. 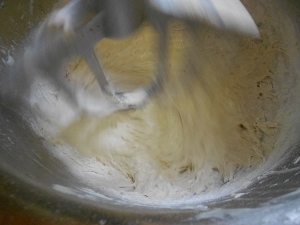 When the sponge is fully risen, return the bowl to the mixer. On low speed working with the paddle or dough hook, beat in the salt and as much flour as needed to make a dough that cleans the sides of the bowl. Increase the speed to medium and knead for 3 to 5 minutes. Turn the dough out onto a floured work surface and knead briskly until the dough is smooth and elastic. 2. For the dough into a ball and transfer it to the oiled mixing bowl. Brush the top of the dough with a little oil, over the bowl with greased plastic wrap, and top with a towel. Let the dough rise at room temperature for about 1 1/2 hours, or until doubled in bulk. 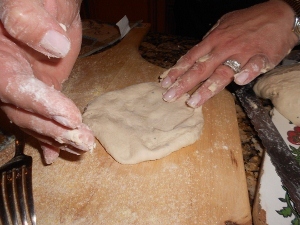 Shaping the Dough: Divide the risen dough in half; work with one piece of dough at a time, keeping the other piece covered. Cut the dough into 6 equal pieces. Work with one piece of dough at a time, keeping the others covered with a towel. 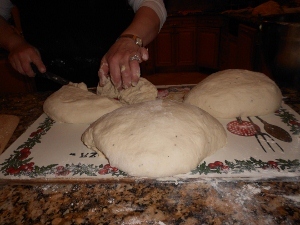 Shape the dough into a round and flatten the center to create a thick 1/2-inch wide rim. Prick the center of the bialy with the tines of a fork and transfer it to a cornmeal-dusted towel or pizza peel; cover with another towel while you shape the other 5 bialys. 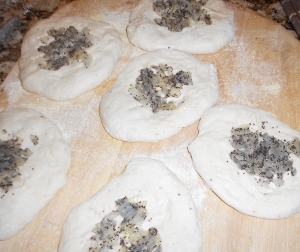 Prick the center of each shaped bialy again and transfer to the prepared baking sheet or peel. 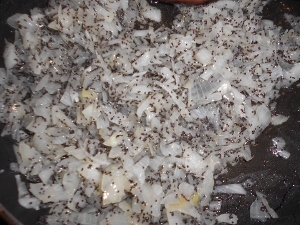 Spoon a little of the onion-poppy seed filling into the center of each bialy and prick again to flatten. Baking the Bialys: Put 4 ice cubes in a cup and add 1/4 cup cold water. 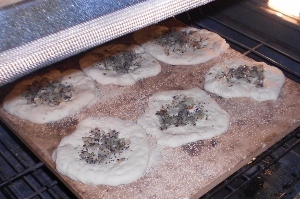 Put the bialys into the oven and immediately toss the ice cubes and water onto the oven floor (or into the hot pan). Immediately close the oven door to trap the steam. Bake the bialys for 10 minutes, turn the oven down to 450 degrees and bake for 5 mnutes more. Transfer to a rack to cool. Brush off the baking stone, if necessary and return the oven to 500 degrees. While the first batch is baking, cut and shape the remaining bialys. Then bake them as you did the first batch. If you have 2 ovens, as I do, you will be able to bake 6 bialys in each oven at a time (that’s all my pizza stone would hold). Storing: Bialys are best the day they are made. You can freeze them as is or sliced in half and wrap airtight. The bialys will keep in the freezer for a month and can be popped into the toaster directly from the freezer.